Map of land owned by the MacIntrye Iron Company in Essex and Franklin Counties. 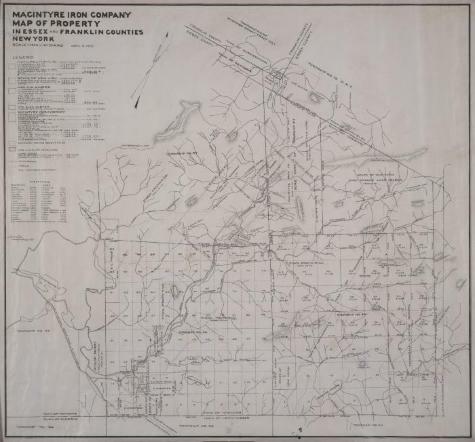 Map also includes land owned by the State of New York, Mrs. Alex Hunter and Finch, Pruyn and Co. Also includes notation of developed iron ore districts, tote roads and trails. Mountains are also identified. The scale is one inch equals forty chains. Source: Adirondack Museum Library, MacIntyre Iron Works records, MS 65-27, box 2, no. 24.